Why I read this book: It sounded funny and interesting. Summary (from Goodreads): Tom Violet always thought that by the time he turned thirty-five, he’d have everything going for him. Fame. Fortune. A beautiful wife. A satisfying career as a successful novelist. A happy dog to greet him at the end of the day. My thoughts: Domestic Violets surprised me in a very good way. It reminded me of a few different books and movies all mashed into one. There was a nice balance of humor and seriousness between the protagonist's work life and home life that made for an interesting story. 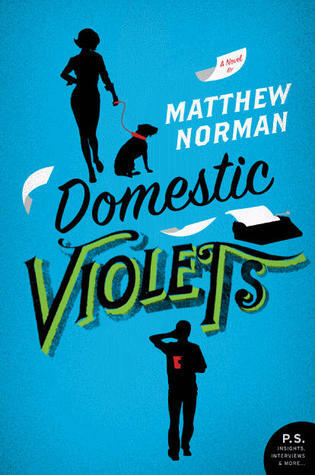 For the most part I really liked Tom Violet, except when he was flirting with Katie, his fellow copywriter at work. I know without that aspect we wouldn't have the conflict but I really wanted him to get it together with his relationship with his wife. Tom became a hero when he finally stood up for himself at work and made a fool of his boss and company. He did what anyone who has ever worked in a monotonous office job has only dreamed of, and in that moment he became a bit of a local celebrity. Tom has always struggled to be different from his Pulitzer Prize winning father, famous author Curtis Violet, so when he writes his first novel in the same style as his father, it leads to realizations about himself and his relationship with his dad. I think one of the things I liked so much about Domestic Violets was that despite all of the things going wrong in Tom's life, he finds a way to pick up all of the broken pieces of his life and reassemble them into something better. He had a failing relationship with his wife, an unbearable crush on a coworker and he's still able to muster the courage to quit his day job to pursue his dream of becoming a writer. He fixes the relationships with the people who are most important to him and realizes what he needs to make him happy. I'm not sure it's all believable but it was nice to get that happy ending for a guy who went through a lot of crap throughout the rest of the novel. Overall, I really enjoyed this book. Norman's writing is humorous and poignant and he has the rare ability to write a likable character who is also flawed in so many ways. Tom has a lot of baggage and he screws up A LOT but I was cheering him on throughout the novel. I think I also may have developed a slight crush on his character. I'd recommend this book for fans of Joshua Ferris, Jonathan Ames or anyone who enjoys routing for the underdog. Domestic Violets has been one of my faves this year! I thought this book was hilarious! Definitely a fun read. And I also had a bit of a crush on Tom. He's so silly yet sweet.